It’s little over a month since the CBSO gave the UK premiere of its co-commission, James MacMillan’s St Luke Passion. Now, on Saturday, January 31 the Scottish composer will hear the premiere of another major new work of his, Seven Angels. This 40-minute setting of texts from the Book of Revelation has been commissioned by Ex Cathedra and Jeffrey Skidmore, who will be performing it as part of their New Jerusalem concert at Birmingham Town Hall. “I’ve written for Ex Cathedra before – just a little Christmas piece – but Jeffrey wanted to pursue a more ambitious project,” the composer explains. And this project certainly is ambitious, aiming as it does to follow on from the New Testament oratorio trilogy planned by Elgar. After burning many gallons of midnight oil toiling over the composition of both text and music for The Apostles and The Kingdom for the Birmingham Festivals of 1903 and 1906 respectively, Elgar ducked out of attempting a work dealing with the Last Judgment. 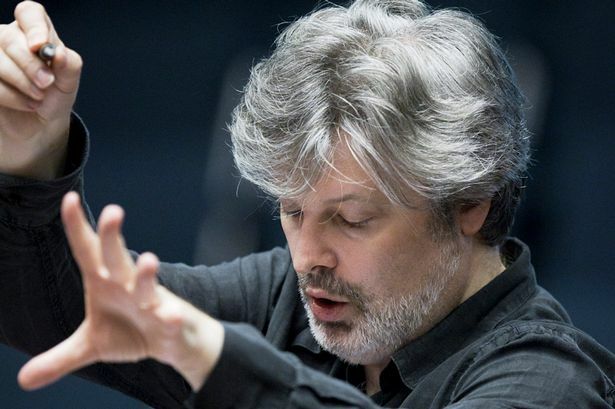 Whether he just couldn’t face the task, whether his faith was wavering, or whether he felt the attraction of pastures new (the symphonies and violin concerto were beckoning) we shall never know for certain, but James MacMillan has taken on the idea himself. He even pays a little tribute to Elgar by including in the tiny instrumental group accompanying the mixed chorus two shofars, the biblical trumpet-like ram’s-horn instrument used by Elgar in The Apostles. How much has James delved into The Apostles and The Kingdom in preparation for his own Seven Angels? While Elgar seemed almost ashamed to be a Roman Catholic, feeling it made him an Establishment outsider, James MacMillan proclaims his faith proudly. He recently wrote an extensive article discussing this Catholic dilemma, and draws my attention to this particular passage. “Elgar was to suffer for his courageous vision, as performances of the Dream were banned as “inappropriate” in Gloucester Cathedral for a decade after the premiere, and performances in places like Hereford and Worcester were only permitted with large sections of the text bowdlerized, with much of the objectionable Catholic dimension removed. “It is thought by some that the vehemence of the reaction impacted greatly on the composer, even to the extent of him gradually losing his faith over the rest of his life. “He may also have been seduced by the fame and praise which came his way in the wake of his more secular instrumental works which turned him into a national treasure. The carnage described in Revelations before the eventual appearance of a new Jerusalem, has obvious resonances in the First World War. The other premiere in Ex Cathedra’s programme, Roxanna Panufnik’s Since We Parted, is firmly rooted in that conflict, as she tells me. “When Jeffrey Skidmore approached me to write this piece, he specified that it should be remembering the First World War and, if at all possible, the words should be by or about a woman. “A friend steered me towards Vera Brittain’s Testament of Youth and, spookily, the book fell open on page 163 where appeared Kathleen Coates’ s poem A Year and a Day. This was written between 1910 and 1913 but is, I think, prophetic of the impending war in its depiction of a woman and man in love, reluctantly separated and missing each other. “Around the same time, my mother sent me the poem Since we parted, yestereve by the Victorian statesman and poet Robert Bulwer-Lytton (1831-1891) – it seemed to fit beautifully as a refrain to A Year and a Day. Since we parted is framed during the first half of Saturday’s concert by two works by Sir Hubert Parry: first the famous Jerusalem, and secondly the deeply moving Songs of Farewell, the composer’s last major work, and written as the First World War was painfully moving towards its conclusion. This important concert also marks an important occasion in Jeffrey Skidmore’s life, the awarding in the New Year’s Honours List of an OBE in recognition of his services to music not only in this country but also abroad. Not least in South America where he has done so much to disinter that continent’s vibrant baroque religious music. But it is of course his work with Ex Cathedra, the chamber choir he founded nearly half-a-century ago, for which Jeffrey is chiefly renowned. Their repertoire covers almost an entire millennium, and Saturday will hear them exploring contemporary music with the same skill as they will bring to their Good Friday performance of Bach’s St Matthew Passion in Symphony Hall. Ex Cathedra perform New Jerusalem at Birmingham Town Hall on Saturday, January 31 (7.30pm). Details on 0121 780 3333.